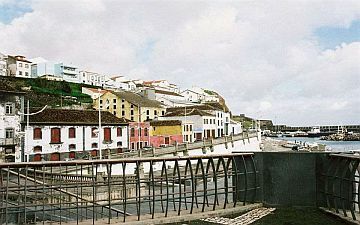 Angra do Heroismo is the oldest city in the Azores and is located on the island of Terceira. The Azores is made up of nine volcanic islands situated directly west of Portugal. The Portuguese were the first to venture out into the Atlantic Ocean and discovered the Azores in 1427. Terceira actually means 'third' and was named so because it was the third island to be discovered. Over the centuries it has had many important visitors including Charles Darwin in 1836 on route to Sao Miguel. Angra became quite a significant port on route to the Americas and one of the best ways to understand why they chose its location is by climbing to the top of Monte Brasil. From there you can see Angra Bay below and how it is protected from the prevailing winds by the surrounding hills and the isthmus that connects Monte Brasil to the rest of the island. The climb to the top is worth doing regardless though, as it has fabulous panoramic views and subsequently has become a very popular site for picnics. The city was laid out in a chequer board fashion, once again taking into account the prevailing winds. During the 16th century a magnificent fortress, Forte de Sao Sebastio, was erected to protect the ships, as pirates were well aware of the valuable cargo coming in from the West Indies. 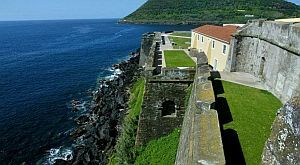 Four other smaller forts were also built along the coast to protect the bay, and the Sao Joao Baptista Castle being one of them is still used today by the Portuguese armed forces. Together these magnificent fortifications created quite a defence for Angra. The fortress has had many illustrious guests such as King Afonso VI of Portugal, who took refuge there after being deposed by his brother King Pedro II. Since being converted into the Hotel Pousada Angra do Heroismo this stunning accommodation offers guests an excellent restaurant serving regional cuisine, two swimming pools, and each bedroom has a marvellous view of the ocean. Angra was subjected to considerable damage following a terrible earthquake in 1980, however much of it has now been restored. In fact the historical quarter was declared a World Heritage Site, and most of the architecture is very similar to the colonial houses of Brazil. If you stroll through the Porto de Pipas here you will find the oldest manor houses in Angra. This town had nine convents in total, each with its own church. The carved woodwork used to decorate the interior of these churches were often made from wood brought over from Brazil. The Convento de Sao Francisco is now the Museu de Angra and outlines the history of the island and its ancient port. It also has a very impressive collection of 16th century paintings, sculpture, maps, and weapons of that time. As mentioned earlier, the town has many historical palaces as well. The Palacio dos Capitaes Generais was originally the Jesuit College before it was converted into a private residence for the Military Commanders, and has an exquisite collection of furniture, artwork, and porcelain dating back to the 17th century. Another place of interest is the town's Cathedral built a century earlier with an impressive interior of carvings made from silver and several beautiful pieces of religious artwork. Terceira has a long wine growing tradition, producing grapes that have been used in Madeira and Port wines. If this is a subject that interests you visit the Wine Museum at Biscoitos where you can sample and purchase some of these wines. The island is made up of beautiful green landscape, small lagoons, sulphur geysers, underground caverns, and a 3km wide volcanic crater. So if you enjoy being in the outdoors there are plenty of activities to enjoy such as hiking, fishing, and horseback riding. There are also organised boat trips and opportunities to go scuba diving. Angra hosts many entertaining festivals throughout the year as well so the atmosphere can be particularly entertaining particularly between May and September. They have every type of festivity imaginable from a beach festival to bull running, live jazz, and rock festivals.